Zonecon of Zone 9 ( Junior Chamber International ) was scheduled on 2nd and 3rd October 2010. It was hosted by JCI Gondia Central. I traveled by car and had a very memorable experience. While returning back from the trip we halted at a restaurant. We had some snacks. My husband wanted to have some soft drink and only Cloud 9 was available. We ordered 2 cloud 9 can's and i was shocked to see the price. One small can of Cloud 9 costs Rs 75. Very high priced product. That is the time i was prompted to do little research and find out more feasible products. There are lots of fruit juices in the market. New products and new markets keep emerging. Few fall down while rest eats up share of other successful fruit drinks and survive. 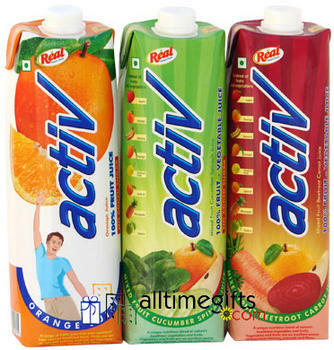 Fruity of Parle Agro, Tropicana of PepsiCo India and Real of Dabur India are market leaders. You will find them placed in almost every shop. They have penetrated all regions and have placed their brand successfully. Real fruit juice tastes good and i love all its flavor. There is minute maid pulpy too by Coca Cola India . I have tried pulpy, its like you are eating something and not drinking it. So i have never tried it again. While going through pricing of fruit juices there is little hike but it delivers the value which it is associated with. I don't feel that fruity, Tropicana or real are overly priced. Its a drink which lots of people can afford and feel contended. Cloud 9 which is a new entrant in the market will face tough competition from fruit drinks which delivers value and doesn't costs much. If i purchase a a Tetra pack of 1 litre Real fruit juice costing Rs 90 i am rest assured that at least four members of my family will drink one full glass each but the same is not applicable to cloud 9. One small can is priced at Rs 75 which can satisfy one single person while i can make a wiser decision by purchasing 1 litre tetra pack of Real by spending extra Rs 15 . Cloud 9 claims its rich in fruits. Are other fruit drinks which are not so overly priced not rich in fruits ? Its still a question as to Why cloud 9 is highly priced ? I remember what my dad used to say- “ First enquire the price than only go for it as it may or may not suit your pocket “. I have learnt my lessons and want you all to check the price before you opt for or purchase something. Think wisely as its your hard earned money and you should not get cheated.